Michigan head coach Jim Harbaugh watches a replay in the first half against Notre Dame in South Bend, Ind., last Saturday. Braylon Edwards, a former Michigan wide receiver and current analyst for the Big Ten Network, was suspended after controversial tweets about the Michigan offense. 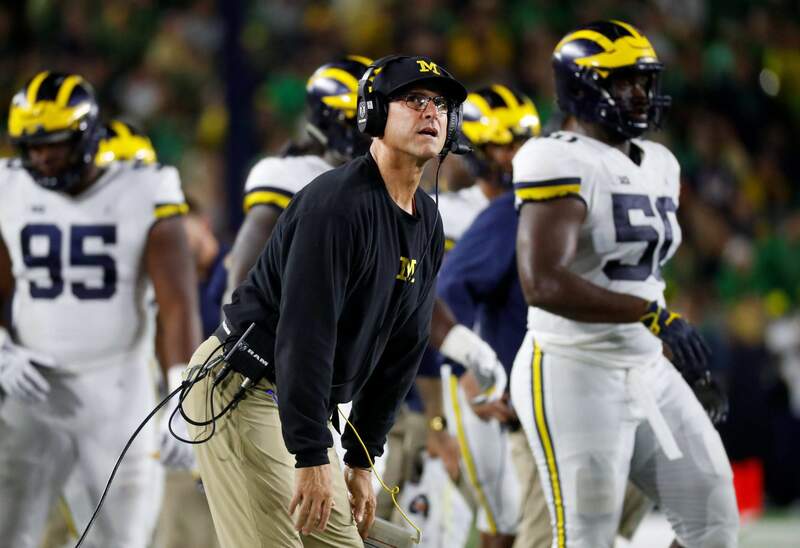 ANN ARBOR, Mich. – The war of words between Michigan coach Jim Harbaugh and former Wolverines receiver Braylon Edwards is heating up. Edwards’ tweet Saturday night, which was later deleted, was directed at U-M center Cesar Ruiz and transfer quarterback Shea Patterson: “Ruiz is weak, line is weak, shea is scared, (expletive) Michigan offense is so predictable.....Michigan football is sadly one thing......Trash,” Edwards wrote. “So funny that everyone is worried (about) my tweet as opposed to the real issue, 0-17 on the road against ranked opponents, 1-6 against rivals and the one win was against a 3-9 MSU. Last thing i will ask and really think about this before you get mad...is Michigan better than Iowa?” Edwards wrote Monday.